TOLEDO, Ohio, January 12, 2017 — Satelytics, an Ohio-based software company, announces one of the world’s first passive methane detection methods for wells and pipelines. Satelytics is a software platform designed for customers in the oil & gas, pipeline, power, and water & wastewater industries that need to monitor large and geographically dispersed infrastructure. Satelytics synthesizes large volumes of satellite and aerial imagery—measured in terabytes—into important areas of focus. Satelytics examined the methane leak over Aliso Canyon, California which was discovered in October 2015 and controlled in February 2016. AVIRIS and WorldView-3 imagery was used. The methane algorithm accounts for wind and atmospheric variation to ensure only the actual plume is quantified. Satelytics is able to monitor large areas, visualize methane plumes, and alert operators if measurements fall outside of prescribed thresholds. 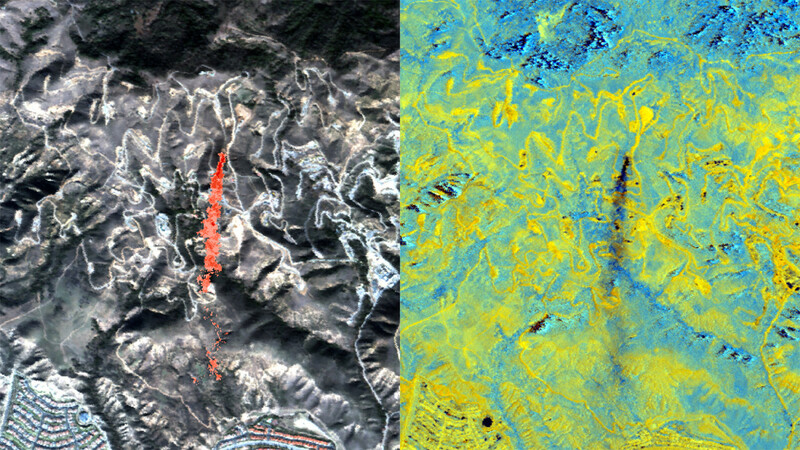 Satelytics routinely processes multispectral data from a variety of sources including satellites, planes, drones, and fixed cameras. Advancements in nano-satellites and commercial space travel means near-real-time monitoring is on the horizon. Satelytics was developed to seamlessly integrate with this high rate of data availability. The objective of Satelytics is to identify and quantify an expanding list of chemical and biological constituents which result in disruption to operations, financial and environmental disasters, and violate governing body regulations. Satelytics identifies threats at the earliest stages possible and notifies customers to the location and nature of the event. Providing data with a high degree of specificity and probability allows Satelytics customers to minimize consequences and mitigate risk. Infrastructure operators can continuously monitor data and alerts using Satelytics to ensure remediation spends and resources are targeted and effective. The growing oil, gas, and pipeline community around Satelytics applies the software to a host of problems including liquid hydrocarbon leak detection, high consequence areas, change detection, heavy metal detection, water quality analysis, and land movement detection. Methane detection will immediately be added to the already impressive list of capabilities within the Satelytics AWS-hosted cloud platform.